“To Live and Die in Mexico” – Gravely injured and unable to communicate with the team in the U.S., Callen, Sam and Kensi, with an unconscious Deeks in tow, search for a safe way home as a cartel boss places a “dead or alive” bounty on their heads. Also, Mosely and retired Navy Admiral Hollace Kilbride (Gerald McRaney) beseech their contacts in Mexico and D.C. for assistance with their missing colleagues, on the 10th season premiere of NCIS: LOS ANGELES, Sunday, Sept. 30 (9:30-10:30 PM, ET/9:00-10:00 PM, PT) on the CBS Television Network. “A Line in the Sand” and “Ninguna Salida” – Sam is shot during a firefight with a cartel, and a suspect reveals new information on the whereabouts of Spencer Williams (Lamont Thompson), the man who kidnapped Mosley’s son five years ago. 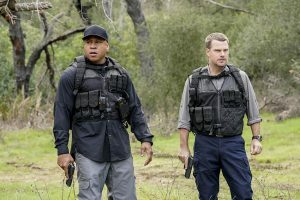 Despite several team members having grave reservations, NCIS travels to Mexico for a daring mission to locate and rescue Mosley’s son, on back-to-back episodes of the ninth season finale of NCIS: LOS ANGELES, Sunday, May 20 (8:00-10:00 PM, ET/PT) on the CBS Television Network. (8:00 – 10:00 PM) – BACK-TO-BACK EPISODES “A Line in the Sand” and “Ninguna Salida” – After Sam (LL COOL J) is shot during a firefight with the cartel, a suspect is interrogated and reveals new information on the whereabouts of Spencer Williams (Lamont Thompson), the man who kidnapped Mosley’s (Nia Long) son five years ago. Also, despite several team members having grave reservations, NCIS travels to Mexico for a risky mission to locate and rescue Mosley’s son. 9th season finale. 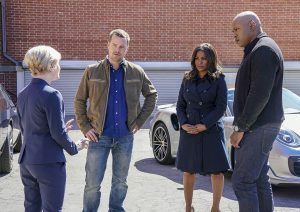 “Where Everybody Knows Your Name” – NCIS partners with the FBI after a Marine is murdered by a rare nerve gas. Also, Deeks shares his dream to quit law enforcement and open a bar, on NCIS: LOS ANGELES, Sunday, May 6 (9:00-10:00 PM, ET/PT) on the CBS Television Network. “Reentry” – Callen, Sam and Nell travel to the Angeles Forest to search for pieces of a failed rocket launch, including a top-secret government device. 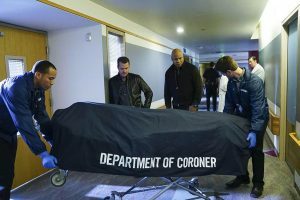 Also, Hetty tries to help Keane (Jeff Kober) acclimate to life in the states, on NCIS: LOS ANGELES, Sunday, April 29 (9:00-10:00 PM, ET/PT) on the CBS Television Network.